AUSTIN, Texas, May 16, 2013 (ENS) – Six people have lost their lives and nearly 100 others were injured as tornadoes touched down in north-central Texas overnight. 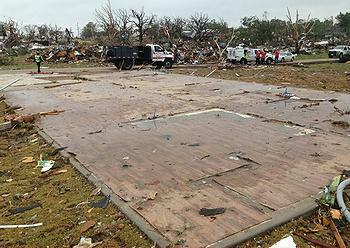 More than 100 homes were damaged or destroyed. Hardest hit was the small Texas town of Granbury in Hood County. The National Weather Service said winds moving at up to 200 miles per hour destroyed homes and knocked out power to the area. At a midnight news conference, Hood County Sheriff Roger Deeds said emergency management officials were still trying to account for 14 people. At a news conference this morning he said seven people were still unaccounted for. “Some were found in houses. Some were found around houses,” said Deeds, warning that the death toll could rise as search and rescue crews go through the remains of tornado-struck homes. 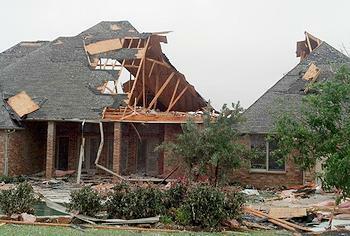 The Rancho Brazos subdivision of 110 homes near Granbury, about 40 miles southwest of Fort Worth was devastated. Deeds said a tornado emerged from a thunderstorm and leveled the neighborhood. Today, 18 bulldozers were brought into the subdivision to clear the way for rescue crews to search for survivors. According to AccuWeather.com, the thunderstorms that tore across northeastern Texas were the result of a strong disturbance over northern Texas. “Warm and humid winds blowing from the Gulf of Mexico collided with hot and dry winds from West Texas, resulting in a twisting motion in the lower atmosphere,” said forecaster Justin Roberti. “As soon as the thunderstorms were able to tap that, powerful tornadoes exploded along and south of the Dallas-Fort Worth metroplex,” he said. Lake Granbury Medical Center put its emergency response plan into action last night to help local residents injured in the devastating storms and tornado. The medical center cared for 37 patients received at the hospital; 15 were transferred to Metroplex hospitals; three patients were admitted for further care, mostly with orthopedic injuries, while 19 were treated and released. In Cleburne, a town of about 30,000 people 25 miles southeast of Granbury, Mayor Scott Cain declared a local disaster after a mile-wide tornado touched down. The mayor spoke of “wide damage, some injuries and loss of property,” but reported no fatalities or serious injuries. “The thoughts of 26 million Texans are with those suffering today, along with our prayers for a quick and full recovery for those still hospitalized, and for this community as a whole,” said the governor. The National Weather Service Storm Prediction Center is forecasting a risk of severe thunderstorms on Thursday afternoon and evening across parts of the southern Plains into the lower Mississippi Valley, from northeastern Texas across southern Arkansas and northern Louisiana. The main threats will be large hail and damaging winds, though tornadoes are possible.